Many businesses have built apps to strengthen their brands and improve customer engagement. But why do you want an app? When people talk generally about “apps” they are usually referring to mobile applications available to download to smartphones and portable devices. They may be small in size from a few megabytes to a couple of gigabytes depending on the content and type of app. There are many different types of apps. The most common type available to consumers are games. This is because as apps are mostly on smartphones, they provide an easily accessible and good source of entertainment. But, there are many other categories featuring a multitude of different types of apps in each major app store. The concept and usage of mobile apps were introduced on 10th July 2008 with the App Store from Apple to complement their release of the iPhone the year before. The Android Market was the next store to open on 22nd October 2008 from Google. On March 6th 2012, it was rebranded as Google Play. On 29th February 2012 the Windows Store, now primarily for apps, was introduced by Microsoft. How many apps are already available? The number of apps in each app store is increasing everyday. Here are the most recent figures that I could find regarding the amount of apps currently in each app store from June 2016. Each of these figures are approximate. Apps like Pokemon Go have been known to generate $720,680 daily. However, this is an anomaly. The Pokemon brand has been around since 2001 and has millions of fans. The brand appeals to both adults and the new generation of children getting introduced for the first time to the games, films and merchandise. The game Pokemon Go is an augmented reality (AR) game that encourages you to walk and, as an added bonus, makes you healthier. So immediately it intrigued the masses and was a great success. It was also developed by Niantic, a company that had experience with games and particularly AR games. The execution of the idea was carried out beautifully in my opinion. The UI is initiative and the graphics and animations are modern and suit the brand well. If you haven’t played the game, feel free to download it and see what you think. Remember, the idea doesn’t matter if the execution fails. The majority of apps make little or no money at all. So if you think you’re going to make an app to generate additional revenue for your business, unless you have sufficient evidence to support that theory, I would think of another reason of why your business needs an app. To get the right product, app development can be long and costly. So ensure your intentions are clear before you begin. What are the reasons for and against having an app? An app will give your business a way to engage with your customers directly and more personally. You’ll easily be able to gather analytics on your audience’s preferences from them directly without them having to fill in forms or go out of their way. An app gives your customers another way to contact you. There are a number of freelancers experienced to develop apps across the different platforms and devices. There are a number of tools that allow a solo developer to create a product for multiple platforms. This means that instead of having to hire two or three development experts for each platform you want to build for, you may get away with just one. Having an app developed for you usually saves you time, but you will need to manage the process. In some cases, management of the process can be just as time consuming as actually developing the project yourself. Outsourcing the development can save your time but it can also be more costly as you have to hire out someone to build your product. Every update you do will require more development time. An app is a tool that will require constant upkeep. If not properly managed, it can be more costly than being developed in house. Pushing out updates to the App Store can range from two to seven days so you need to account for this review time in your release schedule. You may also need to plan in contingency in case the submission is rejected and you need to carry out fixes and re-submit. Apps can be uninstalled from devices as early as minutes after being downloaded. You have to constantly be engaging with your audience and offer them a reason to keep your app on their device and opening it. 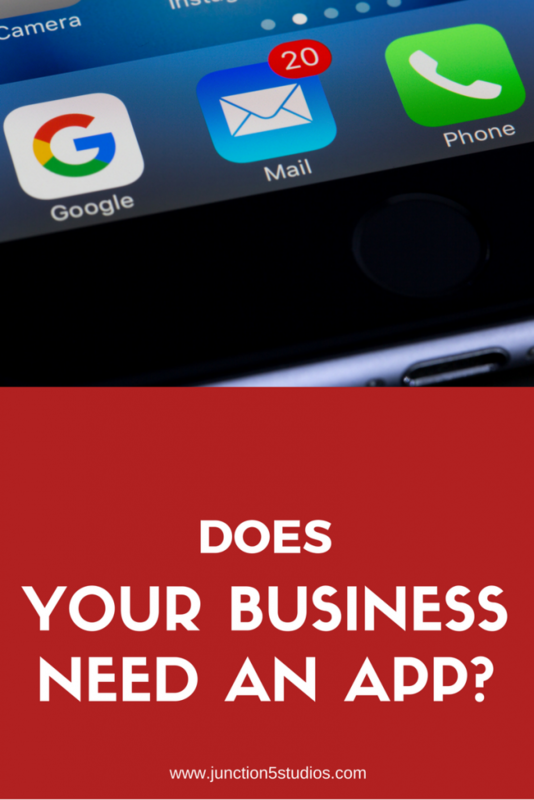 Having an app for your business will become just as important as having a website in the very near future. Apps provide a way for you to directly engage with your consumers in order to cater to their needs making their experience with your company or brand the best it can possibly be. But before you make the decision to jump in and develop an app for your business, ensure that what you intend to build is the right fit. Also take into account whether it’s the right time introduce to your customers. Your audience are who you want to engage with so make sure your app is something they want and can use. If you need more information about whether your business could benefit from an app, contact us for a free consultation.